Should city women care about Women’s Day? Her journey is one every aspiring technology manager will want in a city that virtually sees a startup a week. She is known in tech circles as co-founder of the start-up Aarohi Communications, which was acquired by Emulex Corporation, a California-based firm. In Bengaluru, a startup’s successful acquisition usually means a lot, from a sense of enormous accomplishment at the end of a journey and the beginning of many things new, in addition to just plain becoming wealthier. Shanti Subbaraman did all this as a woman, and while working in urban India. Not easy, most will say. 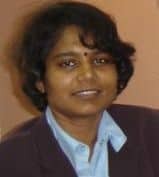 She started her career with Digital Equipment Corporation in the US, and moved back to India with Digital, when they started their Indian operations. She has computer degrees from the University of Oregon and IIT Chennai. Still, success stories about women as dream-chasers are increasing in our cities. And, as is the case with Shanti too, some are attributed in part at least to a supportive family environment. However, does Shanti care about Women’s Day? Does she see her friends and people in her social network taking Women’s Day seriously? In this interview, conducted by Citizen Matters over email, Shanti talks about whether a Women’s Day really matters at all, and if it does, for whom. Do city women care about a Women’s day? Your sense. I wonder if any body really cares much about a Women’s day. The educated, mid/high-income group women use this as an occasion to go out with their women friends and pat themselves on their backs. For the uneducated or lower-income group women who do not get to ‘celebrate’ or ‘be celebrated’ on the so-called Women’s day, it is pretty much a hard day’s work as usual. Do men recognize such a day, do they feel extra nice towards their women colleagues, friends, significant-others on this day…? I haven’t really seen that happening at home or work! The well-to-do women can, anyway, socialize with their friends whenever they want. So the specialty of this day is somewhat lost on me. Do you believe a Women’s day is necessary for urban, educated, economically comfortable women who? I think a Women’s Day is a good thing to have. But I would think it should do something for the poorer classes of women, like the pourakarmikas or vegetable vendors and school aayahs, who are taken for granted, than for the urban, educated, economically comfortable women. Of course, it does help to recognize women achievers of all strata of society and create role models and sources of inspiration for other aspiring women. Who amongst your friends in the city takes Women’s Day very seriously in your opinion? No need to name anyone, just tell us about the type of person, occupation..
Nobody in particular. I do have some friends who send Women’s Day greeting messages, thank you notes, organise lunches, etc…I don’t believe that is being very ‘serious’. What do you mean that’s not very serious? For our well-networked urban community, nothing is easier than sending SMSes and email messages. By taking something ‘seriously’, I understand it as making an effort to improve something, in a way, making a difference to somebody’s life. I don’t believe such a difference can be made by calling one day Women’s day…the best gift a hard-working woman would like is a day off, but then she has to get back to work the next day! You’ve said to me earlier that you had it easy. Supportive husband, family, access to funding for your startup enterprise, etc. Others may not have. Emphathetically, when you look around and look at other women in our cities, who you know did not reach their potential, what would you say to them woman-to-woman? I feel fortunate and happy to have been able to pursue and realise my career ambitions. Of course, I worked hard for it and built a supportive ecosystem around me to make things work for me. I was lucky not to get caught up in the typical pangs of guilt that many working women feel, leaving their children with a babysitter/day-care, probably because I was very clear-headed about my career and there was no dilemma in making those choices. My priorities were clear to my family as well, and they believed in my abilities, so we found ways to manage the home and kids and I guess the stars were all aligned! Shanti Subbaraman with her second son Nishant, 13, an 8th standard student at Koramangala, Bengaluru. I do know that this does not come easy for most women. Not everyone has families that whole-heartedly say ‘go chase your dreams’. Also, women themselves are the ones with the biggest doubts, and that’s where the problems start. If one has the capability and conviction, then usually, hurdles can be overcome – with a little or a lot of effort, but they can be overcome. When one has self-doubts, then it’s easy to settle down to a level way below one’s potential. I believe, at every stage in life, as a student, as a wife, as a mother, one must take cognizance of what one really wants to do with one’s life (more so, in the case of a woman, who is torn by societal pressures of home-making and child-care), socialize the same with one’s partner and family and get their support. One must, of course, be understanding of the circumstances and put one’s ego aside. In my case, when my husband was going through the travails of starting up a new business, I had a steady corporate job (not that it was not hard work, but it was not mental tension), and when his business was in steady-state, I ventured to try and build a start-up. Now he is back to start-up mode and 80-hour work-weeks again and I am taking care of home. Consciously or unconsciously, we have been trying to be supportive of each other. Take our ‘modern/global’ Bengaluru which offers better paying jobs for many. Are family life and social structure here really allowing women more freedom to pursue their careers/occupation and self-actualise? Is Mumbai where you lived before (or any other city you know well) any different? I think it’s not so much Bangalore or Mumbai – I think it is the nature of work. IT as a profession offers more flexibility in terms of work hours and location. The same is not true for teaching, medical and so many other professions where one has fixed hours and fixed locations of work. May be nuclear families are also allowing women more freedom these days. Tell us about what you are doing now. And a little bit about your family. I am currently engaged in part-time consulting work. I have also been busy with music performances, workshops and audio CD production, as part of a classical music group called Sunaad. My husband Dilip Panicker is co-founder and chief techie at Polama.com. I have two sons, one Ashvin, 17, in 12th Std., and the other Nishant, 13, in 8th Std. Muniyamma, the milk-seller who helped police in the investigation of Rajiv Gandhi’s assassins is awaiting her promised rewards.